Cheran, Michoacan practices traditional indigenous forms of self-determination and self-defense. The entire banking system would have been destabilized? In Cheran, Michoacan, Mexico the news of HSBC’s immunity from criminal prosecution and US sanctions comes as no surprise. Organized crime has been prevalent in the community since 2000. After a 2008 mayoral race that left a PRI (Institutional Revolutionary Party) candidate in office, illicit activity increased substantially. The community learned that organized crime is an integral part of local politics and economics everywhere. Cheran is a beautiful small indigenous Purepecha mountain community surrounded by precious forests, that knows the true cost of those profits laundered. Immediately after the 2008 mayoral race the community began experiencing the devastating effects of dog eat dog capitalism of which organized crime is only another part. The first community members who began to defend their forest were simply and quickly assassinated. From 2008-2011 the situation only became worse. Criminals charged protection to run even a small business in the community of Cheran. The forest was raped and terror reigned as anyone felt at risk. The city would become a ghost town by sunset. This is a reality confronted by too many communities in Mexico every day. Murders, disappearances, kidnappings, the criminal amounts of illegal logging and the reign of terror came to a head on the early morning of April 15th, 2011. A group of women had begun quietly organizing in the days before an action to bring the ravaging of their town to a halt. On April 15th, with children and youth at their sides, the women rose up and attempted to detain loggers traveling through town. The loggers tried to run the women over and in response the community reacted as a whole, and began burning the loggers’ vehicles and began detaining the loggers themselves. It is at this point that the community recognized the complicity of the local police when it was police officers who guided organized crime thugs to the place where the loggers were being held, in an attempt to violently release them. The community erected “fogatas” or bonfire barricades throughout town in order to prevent violence against community members. Within days the community decided that it no longer trusted any politicians from any political party or any of the local and state police. They began to organize for self-determination and self-defense and chose to return to their traditional Purepecha forms of self governance. A general council of community elders was elected and commissions were formed in order to carry out the community’s logistical, social, economic, and political needs. Community members simply say that they referred to their history and referred to their elders in order to return to the way the community was organized before political parties, police, and organized crime existed. The general council is legally recognized as the governing body of Cheran, Michoacan today. The community has maintained that they only have three demands: safety, justice, and the reforestation of their territory. They have actively been reforesting the entire region and take that aspect of their struggle very seriously, and remind us that for them protecting the forest is both a traditional and a spiritual obligation. Cheran does not believe that anybody will ever be able to bring them justice for their dead, disappeared, and displaced as a result of the conflict, nor do they expect anyone in power to understand the justice they seek for the forest. Today Cheran knows that justice is something that they will have to take care of obtaining on their own from now on. When it comes to safety, the world is able to see what it looks like for a community to take responsibility for its own safety through traditional indigenous forms of self governance and self-defense. Shortly after the 2011 uprising began, community members state that the local politicians and the police simply exiled themselves in fear from the community, warranting no need to run them out of town. Community members took the local government offices, took police trucks, took the polices’ weapons, and put them all to use. Historically, Cheran had traditionally been “policed” or defended by members from the community. In a voluntary rotation members from each of the four “barrios” or neighborhoods would patrol the community for self-defense in what is known as the “community ronda.” After the uprising the general council made a call out for volunteers to participate in the community “ronda”, or community guard. Community members maintain that police are imposed by the government, but the “ronda” is a traditional way in which community members protect themselves and their community. Today the “ronda” is separated into two parts. The “ronda comunitaria” which is responsible for patrolling and protecting the community from within its borders and the “guardabosques” or forest defenders, which patrol the outskirts of town and deep into the forests in order to protect community members living in those more rural areas and in order to protect the forest itself. 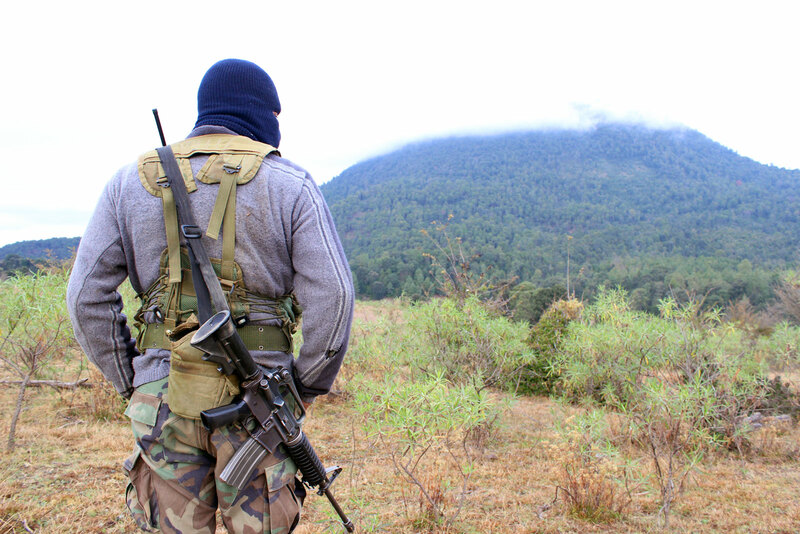 Cheran is not the first community in Mexico to return to their traditional means of community self-defense, nor is it the first place in the state of Michoacan, nor in the indigenous Purepecha region. Other communities have engaged in similar practices of self governance and self-defense, and little by little more and more communities are seeing traditional self governance and self-defense as a viable alternative to corrupt politics and submission to organized crime. Recently council members from Nurio, Michoacan, a larger community and long time practitioner of self governance and self-defense, suggested that the entire Purepecha region should begin to organize a regional “ronda” that could potentially coordinate self-defense patrols on a regional level for the indigenous Purepecha people living throughout the state of Michoacan. It is hard not to throw your hands up in the air in resignation when you hear about criminals such as HSBC being granted immunity from prosecution and sanctions, but it is even harder not to throw a fist in the air when you see indigenous Purepechas successfully overcoming organized crime, corrupt politicians, and big business by establishing models for self-determination and self-defense, on a community level. We do what we must do to protect the land and our peoples. In solidarity and with a great concern I pray for your land and your people.